We know you place value on healthy, attractive teeth. So in order to maintain them, the earliest possible care is essential. At Coleman Dental, we keep you smiling by offering state-of-the-art cosmetic imaging and caries (tooth decay) detection technology as our standard of care. Cosmetic imaging is an advanced graphic technology designed to create a new smile, or a whole new look, before a cosmetic dental procedure even begins. 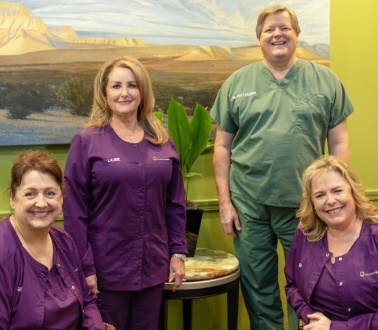 Dr. Coleman understands that everyone is different, so every patient gets a chance to design his or her own “smile personality” before deciding on the appropriate procedure. Imaging starts with our ORTHOPHOS XG 3D imaging system that reduces scan times and produces brilliant high-definition panoramas. It captures the whole jaw in a single span and provides a 360-degree visualization of proposed solutions and treatments. This highly sophisticated technology fuses imaging with design, for safer and more reliable results. Thanks to our caries ultrasonic detection and monitoring devices, it is easier to detect and treat tooth decay, a highly preventable disease. The handheld instrument offers a painless, non-invasive, and convenient alternative to traditional x-rays and allows us to identify and track early changes in your teeth. As a result, we can treat potential lesions before a cavity develops, reducing your risk of ever needing a filling or having to undergo a costly invasive procedure. We rely on digital radiographs, which use 90% less radiation than its traditional film predecessor, to provide immediate images of your teeth and gums. This technology is becoming common practice in dental offices nationwide. To learn more about this breakthrough technology, please visit our make an appointment page to schedule a consultation with Dr. Coleman.